Gainesville is located in North Central Florida between Interstate 75 and US Highway 441 and is equidistant from the Gulf of Mexico and the Atlantic Ocean. Gainesville is located approximately 129 miles from Tallahassee; 96 miles from Orlando; 118 miles from Tampa and 298 miles from Miami. Demographically, Gainesville ranks 15th among Florida’s most populous cities; more than 27 percent of its population consists of individuals between the ages of 25 and 44 years. Gainesville is an outdoor enthusiast’s dream destination offering world-class venues for snorkeling, canoeing, and kayaking, incredible hiking and biking and even bird- watching. Paynes Prairie State Park Preserve, located just 20 minutes from historic downtown Gainesville is a 21,000-acre wilderness preserve and home for more than 800 species of plants and 430 species of vertebrates including 271 species of birds. Although an incredible sanctuary for natural Florida wildlife such as alligators and bald eagles year-round, visitors in mid-October to Late November can marvel the annual fall migration of the Sandhill Cranes. Bison and wild Spanish stallions roam freely in this lush natural North Florida sanctuary. Located in northwest Gainesville, the 7,000-acre San Felasco Hammock Preserve State Park is one of the finest examples of climax mesic hammocks remaining in Florida. With rolling hills, short climbs, sinkholes, upland forests, hammock and prairie, San Felasco offers prime hiking, biking trail and the equestrian trails. With the largest number of high-magnitude springs in the world as well as several pristine rivers within less than an hour drive, the Gainesville area offers a wealth of snorkeling, scuba, and kayaking, and rafting adventures. With Gainesville’s seasonal sub- tropical climate coupled the natural springs annual average temperature at 72 Fº, a trip to crystal clear springs is an inviting adventure year-round. Gainesville and the surrounding area enjoy a sub-tropical climate year round with mild winter averages in the upper 50’s to mid-60’s while warm, humid summer temperatures hover in the upper 80’s and lower 90’s. Average annual rainfall is approximately 35-40 inches. 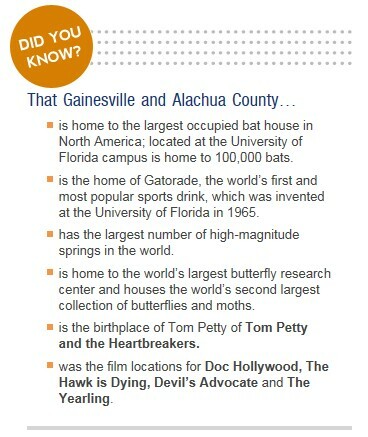 The Gainesville Regional Airport is approximately 15 minutes from downtown as well as the University of Florida campus. Commercial service includes daily flight service via Delta Connection/ASA, Continental/Gulfstream International Airlines and US Airways/PSA. DayJet, the new per-seat, on- demand jet service, is now also available. The UF Department of Housing and Residence Education helps graduate students find housing both on and off campus. It also sponsors educational and social programs for on-campus residents, to enhance their overall educational and living experience at the University of Florida. To learn more, please visit UF Department of Housing and Residence Education page. The UF Department of Housing and Residence Education offers attractive housing options specifically reserved for graduate and professional students, as well as student with families of their own. To review their available choices, please visit UF Graduate and Family Housing page. The Continuum is a new venture in UF-affiliated off-campus housing that features affordable luxury graduate student accommodations within steps of campus, downtown Gainesville and the new Florida Innovation Hub at UF, with convenient amenities galore. To learn more, please visit The Continuum home page.